There is even greater consensus regarding the effects of the crisis. A whopping 85 percent of those interviewed said that they are definitely being affected in one way or the other. The most commonly cited impact for 61 percent of poll respondents was higher food prices. Likewise, 62 percent of the people polled for the survey observed that the cost of living had risen since the onset of the crisis. Naira depreciation was also cited as an important effect of the crisis by 34 percent of respondents, and 35 percent of the people polled had been affected by job losses. Increased energy costs (of petrol and diesel) were taking a bite out of personal incomes for 14 percent of respondents, and 7 percent had lost investments due to the collapse of the stock market. 3 percent of the poll respondents had also been hit by tax increases and higher bank lending rates. On the contrary, 11 percent of respondents had not been affected by the economic crisis. Respondents for the snap poll were randomly selected from a database of phone-owning Nigerians compiled by NOI Polls in collaboration with Gallup Poll USA. 527 people took part in the telephone interviews over a four day period from March 18 to 23, 2009. 69 percent of respondents were male, while 31 percent were female. NOI Polls adopts scientifically robust techniques in conducting opinion surveys. The snap polls are valid within a statistical margin of error, also known as a 95 percent confidence interval. 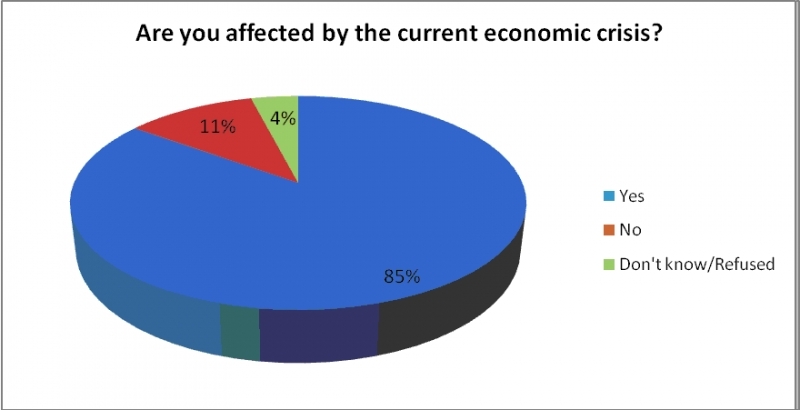 In the poll, respondents were asked whether they had been affected by the economic crisis, and to choose from a series of possible effects on their businesses and families. 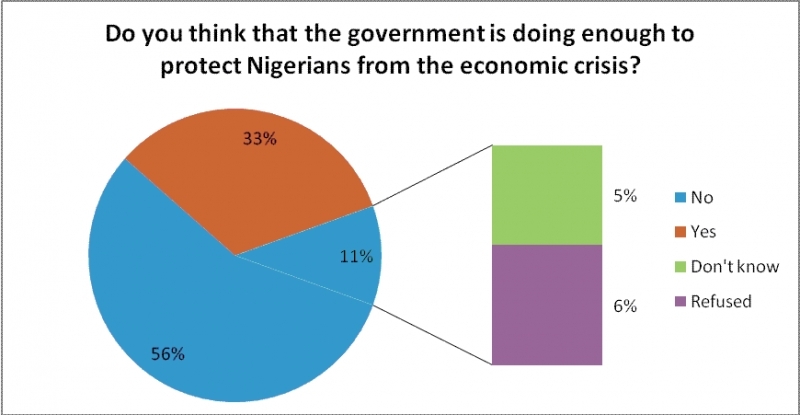 They were also asked if the government was taking adequate steps to protect Nigerians from the crisis. The findings of the latest NOI snap poll reflects a trend of deep and increasing anxiety across the globe precipitated by the decline in economic health of countries in all parts of the world. World economic growth is predicted to be a measly ½ percent, as the credit crunch bites deep into the world’s largest economies. The oil price tumbled from a record high of US$147 in July 2008 to US$45 in March 2009. Given that oil and gas exports constitute 98 percent of Nigeria’s export earnings, the country faces an oil price shock in 2009. There has been an unprecedented short-term depreciation in the exchange rate of Naira to the US Dollar from N 117/US$1 in mid-2008 to N174/US$1 in March 2009. The value of traded equities in the Nigerian stock market fell by 60 percent between August 2008 and January 2009. Inflation, interest rates and unemployment are on the increase, as individuals and businesses alike grapple with the challenging economic conditions. Previous snap polls by NOI Polls include an assessment of public reaction to Nigeria’s ceding of the Bakassi Peninsula to Cameroun, the causes of the outbreak of violence in Jos, and Nigerians expectations of the first black President of the United States, Barrack Obama.